Thai red chicken curry is on the menu of every Thai restaurant everywhere outside of Thailand for a reason. It’s just damn tasty. Everybody loves it. You will too. It’s popular for a reason. It’s creamy from the coconut. The flavours are complex. A bit spicy but not crazy hot. And it’s versatile. You can make it with shrimp just as easily as chicken. You will need to get to an Asian market to get a few of the ingredients. Kaffir lime leaf being the key one. Thai basil is another. Might as well grab some Thai red curry paste and coconut milk while you are there. It will be cheaper. Once you have the ingredients, though, this is easy weeknight cooking. The key is the curry paste. Asian markets have a bunch to choose from. I like Maesri brand but I’m sure they are all good. I learned how to make Thai red chicken curry about a million years ago from a Thai lady. She taught us how to make curry pastes from scratch. But she also told me that pre-fab curry pastes were allowed. That’s my get out of jail free card. The Thai lady said it was OK. So I’m passing that card along to you. You can make your curry paste from scratch as well. It’s not hard. But it is more work. Maybe try it this way first. If you want to get more adventurous there are a lot of curry paste recipes around. There are recipes out there that call for only one or two tablespoons of curry paste. I don’t get that. At two tablespoons of curry paste this recipe is dull. No taste. Well maybe some taste. Mostly of coconut milk. It takes a lot to get it into the flavour zone though. Six to eight tablespoons may seem like a lot but it’s not. It’s really not. 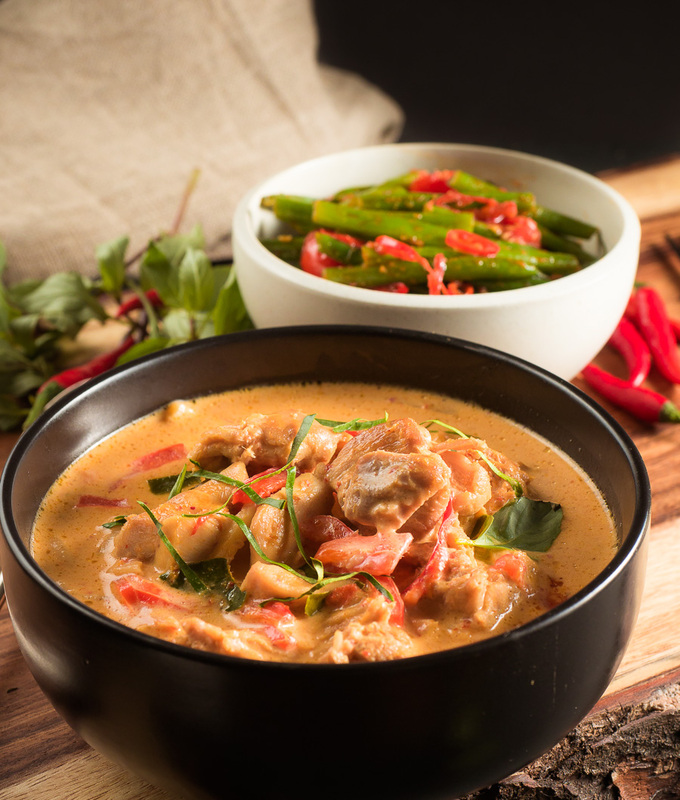 Thai red chicken curry. It’s going to taste great. Like your local favourite restaurant I bet. And it’s super easy to make when you cheat like me. Enjoy. 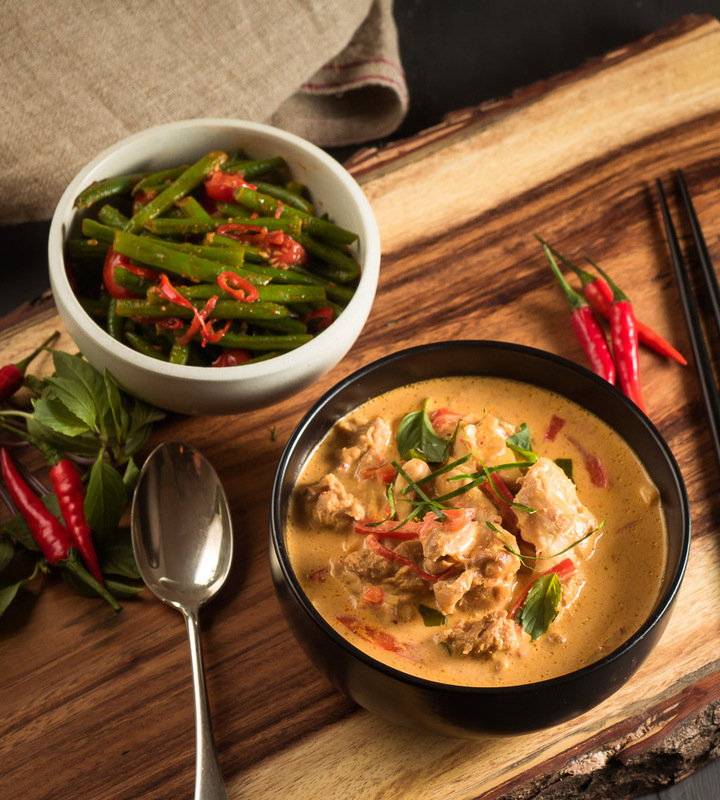 Thai red chicken curry doesn't have to be a lot of work. This dish comes together in under 30 minutes. 1-2 fresh red chilies - thinly sliced (very optional) but if you like spicy this curry is quite mild without it. Add 1/2 can of coconut milk to heat through, then mix in the red curry paste. Stir to combine. Mix in the chicken and cook, stirring constantly, for 3-4 minutes. Add the remaining coconut milk, bamboo shoots, red pepper, lime leaves and chilies if using. Simmer until the chicken is cooked through - somewhere between 10-15 minutes. Stir in the fish sauce and add the Thai basil. Garnish with red chilies and julienned kaffir lime leaf if you like. Note there are red chilies and there are red chiles. If you are using Thai red chiles roll back and start with maybe half of one chili. In main course, poultry, thai. Bookmark the permalink. Thanks for the great recipe. One small step missing is to add the rest of the coconut milk. Jasmine cardamom rice and French beans with mint and almonds made an amazing meal! Thanks for the catch Ken. Corrected above. You are very welcome and I’m glad you liked it! Sounds like an amazing menu.